Throwback Thursday : Where's Waldo - VR Edition! I guess this isn’t really a throwback, but it really brings the past back to the future! 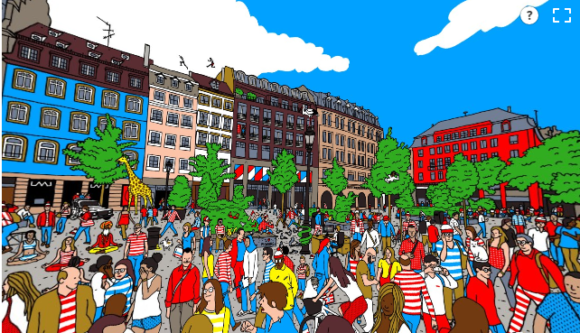 If you don’t know what Waldo is, we’re going to give a brief history of “Where’s Waldo” below. For those who are interested in pure fun and no history, skip all of the text below and head right down to the interactive picture. Your goal? Find Waldo =). Martin Handford is the British Illustrator who created the iconic red-and-white striped shirt man in 1987. Handford started young. He was drawing since he was a boy and found it exciting and fun to draw crowded scenes. He felt it brought life to his illustrations on paper. Handford literally made a living drawing crowded scenes- he did so for several magazine and advertising companies- talk about being successful no matter the niche and or specialty! And somewhere down the line, one of the art directors suggested that he place a character inside the crowded scenes- to create a focal point to encourage viewers to engage with the illustration more. Viola- the idea of Waldo was created. The first book was published in 1987, and wasn’t actually called “Where’s Waldo” instead it was named “Where’s Wally.” Interestingly, several countries have their own names for “Wally”. The US / Canada call Wally “Waldo”, “Charlie” in France, “Walter” in Germany.